If you know me at all, then you know I LOVE Harry Potter. I was thrilled when Marissa from Raegun Ramblings asked me to be a part of her Happy Harry Potter Blog Series this year and WOW, the creativity and talent from all the bloggers participating is mind blowing! Harry Potter is so near and dear to my heart because I grew up reading the books over the course of 10 years which when you think about it, is a third of my life! 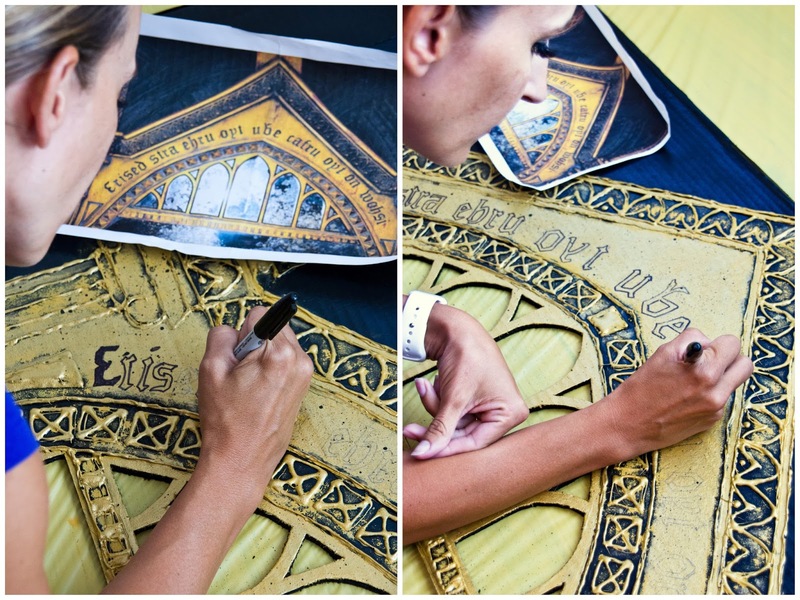 ...created new Harry Potter crafts for future parties. 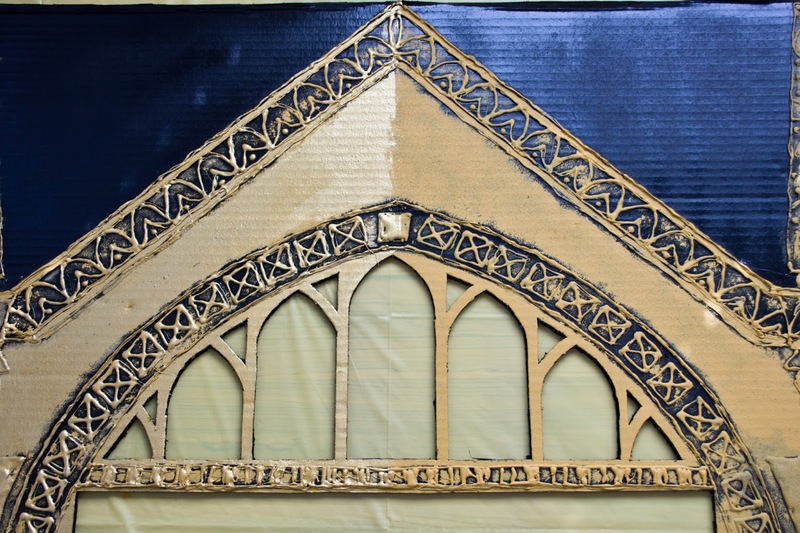 This year I decided I wanted to create a Harry Potter inspired project that no one else had done before. After looking through Pinterest for what seemed like days I had almost lost hope but then I decided to watch "Harry Potter and the Sorcerer's Stone" for inspiration and that's when lightening stuck! 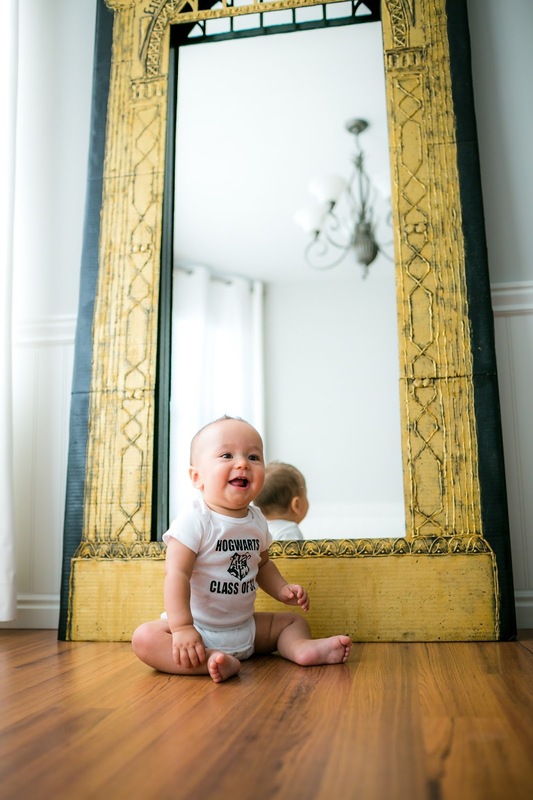 My friend Kellie and I created something really unique in this mirror and I can't wait to use it as a photo booth opportunity for my daughters "Hazel Potter" 1st birthday this winter! 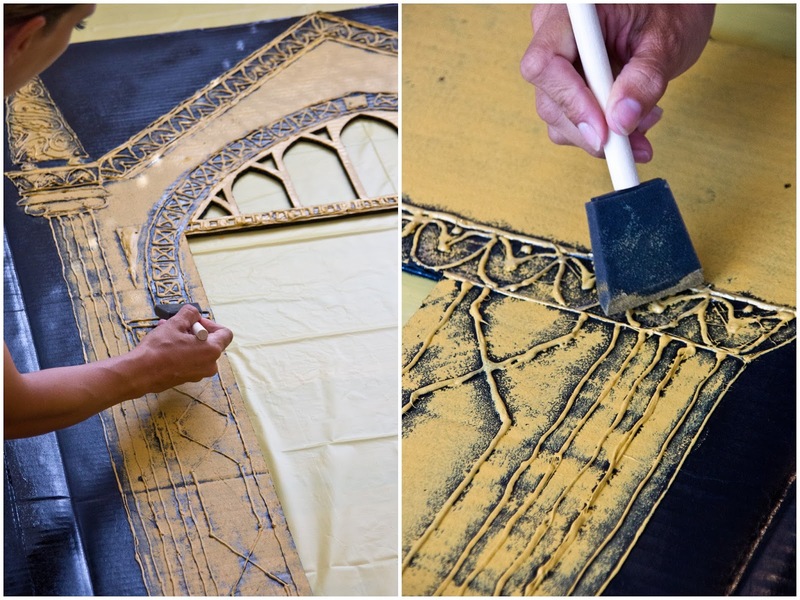 Without further adieu, here is our tutorial (with helpful templates) on how to create your very own lightweight, cheap and REALISTIC, Mirror of Erised. 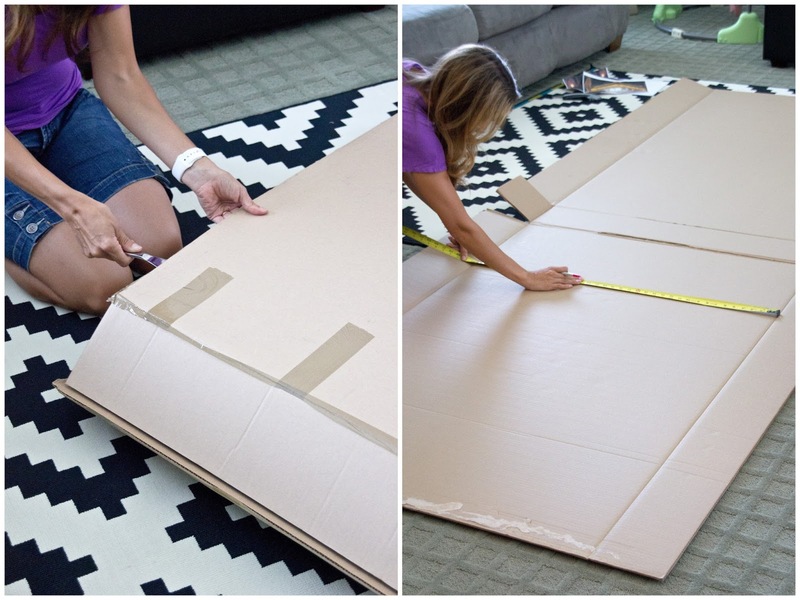 Depending on how big your mirror is, you need to find a cardboard box that is long enough to cover your mirror. I just asked around on my neighborhood Facebook Page to see if anyone had a large appliance type cardboard box that they were getting rid of and wa-la someone had a huge flat screen box I used for free. Brilliant. 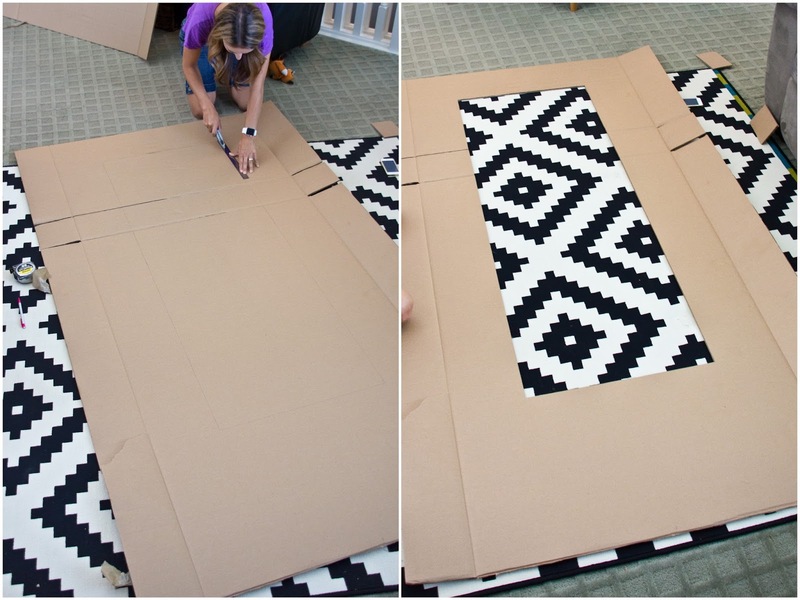 We started by opening up the flat screen tv box up and laying it flat. I own the Ikea "Mongstad" Mirror and I know it's a popular mirror, so I thought it would work great for this project. 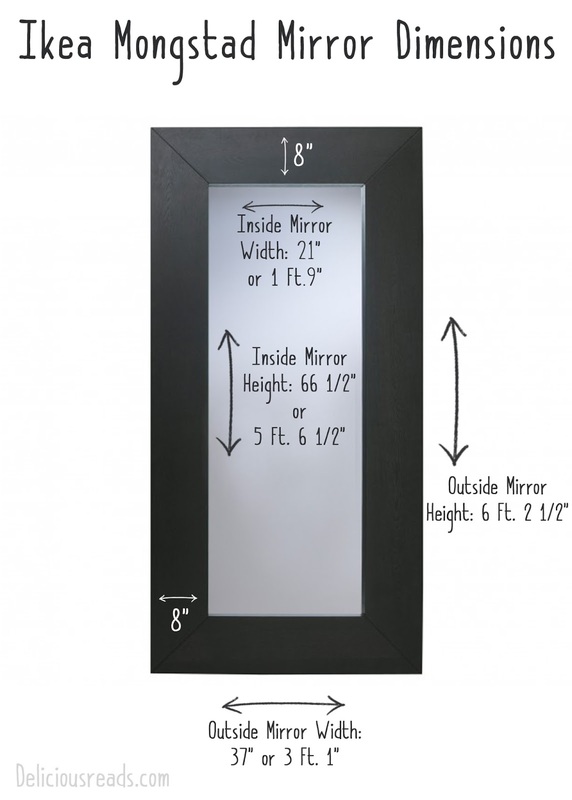 If you don't own or have access to this mirror don't fret, simply adjust the measurements to any large mirror you own and it will still look great! I've provided all the measurements for the Mongstad mirror below so you won't have to think about a thing other than where you put your pumpkin juice. 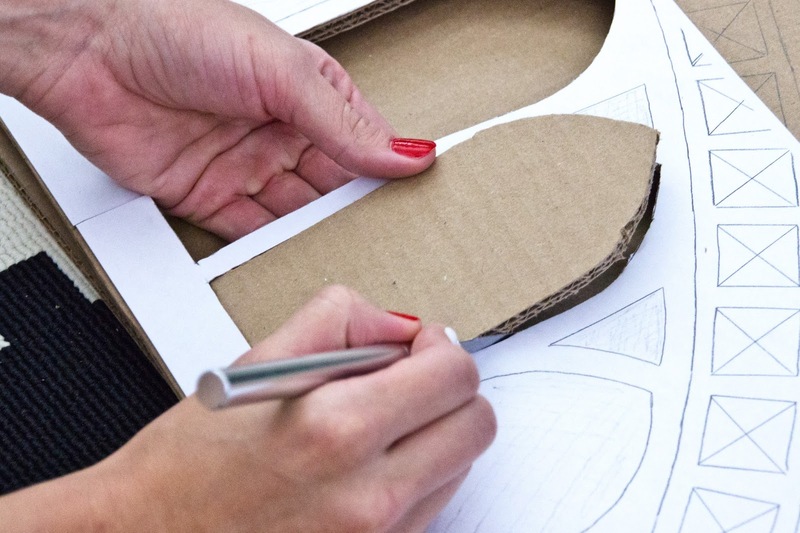 Once you have your box laid out flat you need to go to your mirror and measure the dimensions. 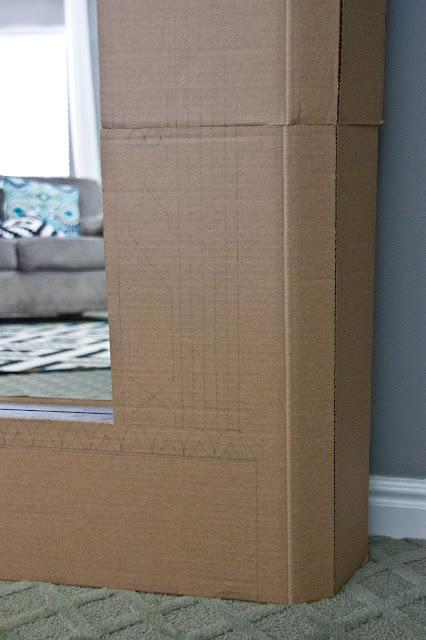 We measured the outside of the mirror as well as the inside, then we drew the outline of the mirror onto the cardboard, using a ruler or yardstick to draw straight lines. 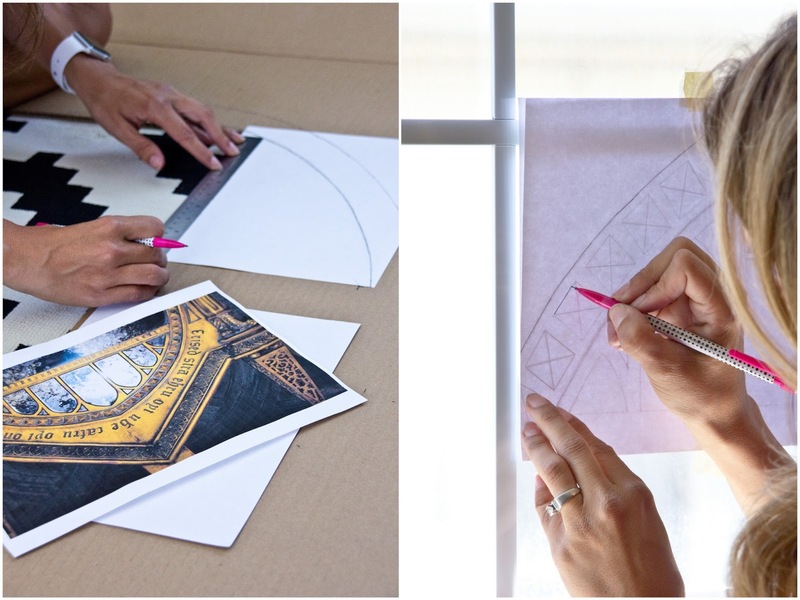 Next, take a box cutter and use the ruler to guide the box cutter and cut out the inside of the box where the mirror shows through to create the frame. Try to find the longest ruler you can because it will make it easier, something like this one. 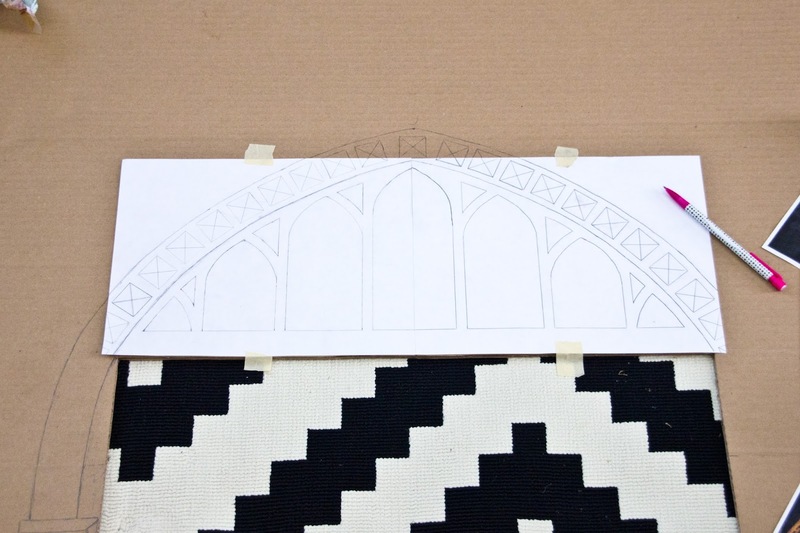 To create the arch I sketched out one side of it first then did a little trick so that both sides of the arch would look exactly the same. 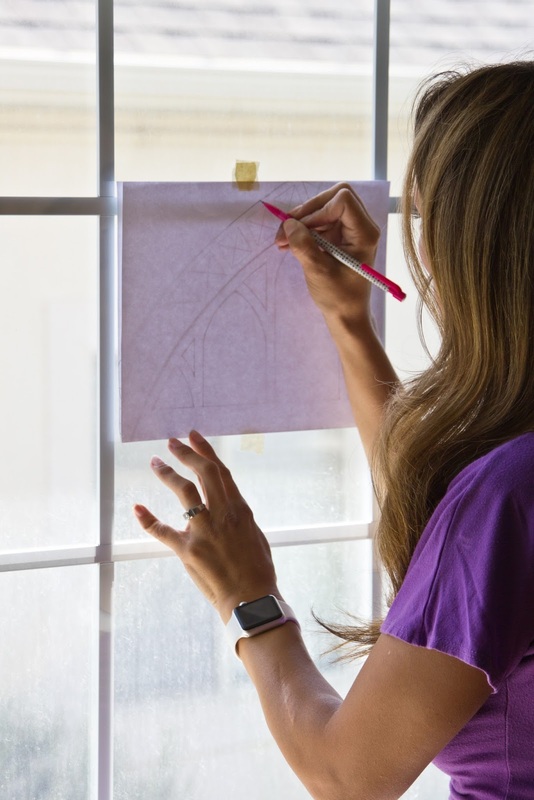 TRICK: I went to the window and taped the paper I just drew backwards onto the window then I traced the arch on the top piece of paper so it looks like the opposite of the one that was drawn first. Wa la... Now you have an exact mirror image of the first sketch! 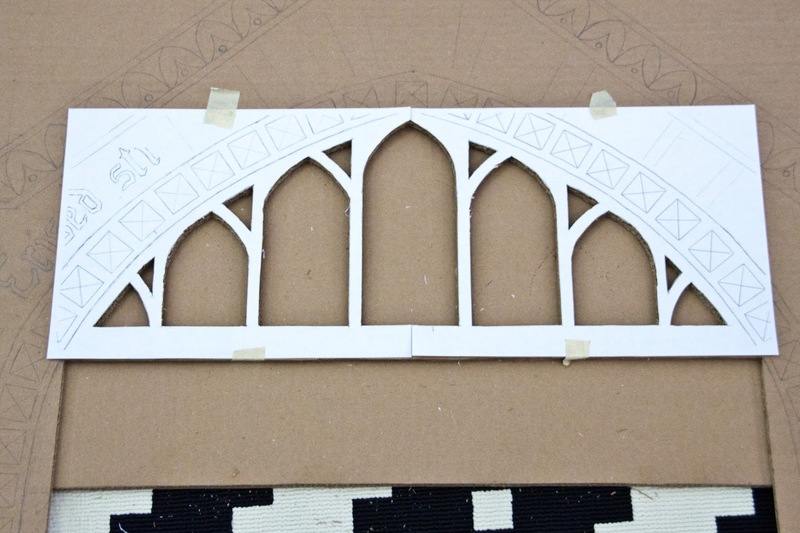 Here's our arch sketch laid out on our cardboard frame, taped down ready, to be cut. Here's where things really start to look good! 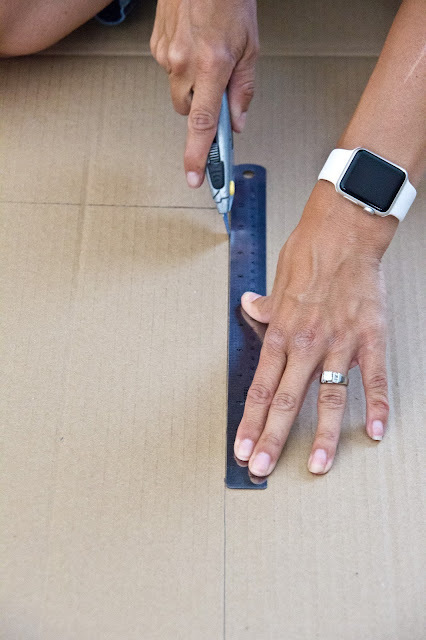 TIP: Be sure to put something underneath where you're cutting, maybe a spare piece of cardboard, so that you don't accidentally cut into anything important. We used an Exacto knife on this part because they were smaller cuts and with a little patience it turned out great! 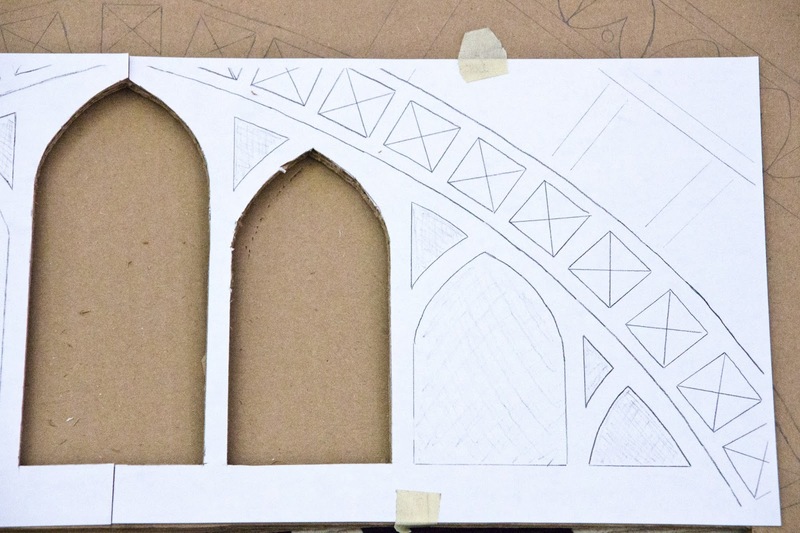 Next we sketched the pillar points on each side of the frame and then traced them on trace paper to do the other side the exact same. 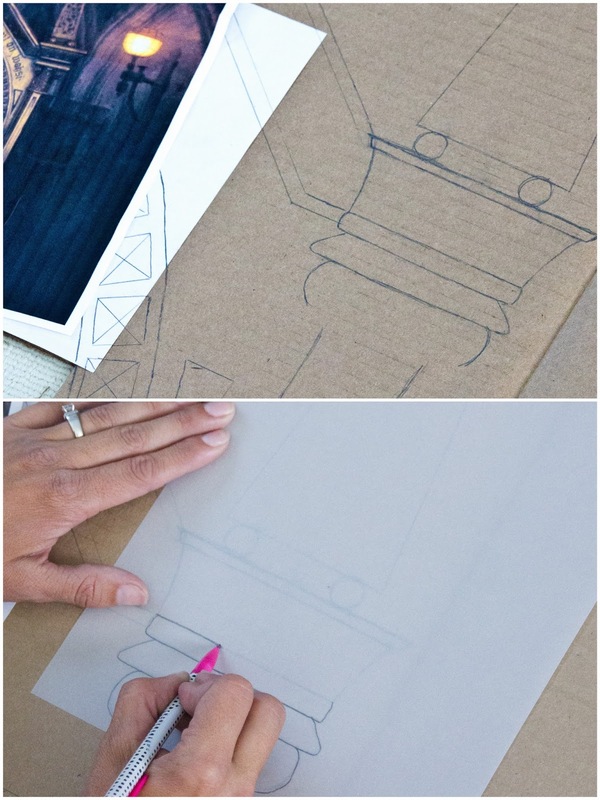 When you go to do the other side make sure to turn the trace paper over and with a pencil go over the exact lines you just put on the paper. Now with the edge of the lead on your pencil, put as much lead on top of the original lines you copied and then place it where you want it to go and trace over the lines with your pencil again. 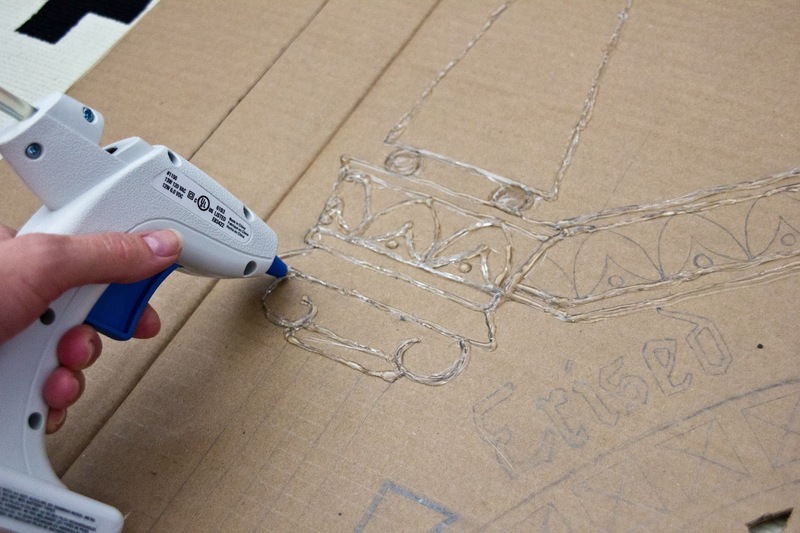 This should transfer the lead you rubbed on the underside to the cardboard. After you've drawn the tops of your pillars trace the straight line of the columns all the way to the bottom of the frame. I sort of created my own version of what the bottom of the frame looked like so have fun creating your own unique designs! My cardboard wasn't long enough so I had to piece it together. I added support by hot gluing these wooden paint sticks for great support and reinforcement. Side Note: I originally duct taped the pieces together with Popsicle sticks before I spray painted it when I realized that wasn't enough support. That's when I got smart and added the paint sticks so I would suggest spraying it back after you have everything in place. I know it's just the back of the frame but some of the edges show up in the reflection so I wanted to make sure that didn't happen. It looks pretty good from the front but if it seems a little off that won't matter later once you start hot gluing and painting. Get your fingers ready for a workout because this VERY important step takes a while but the payoff is AWESOME! 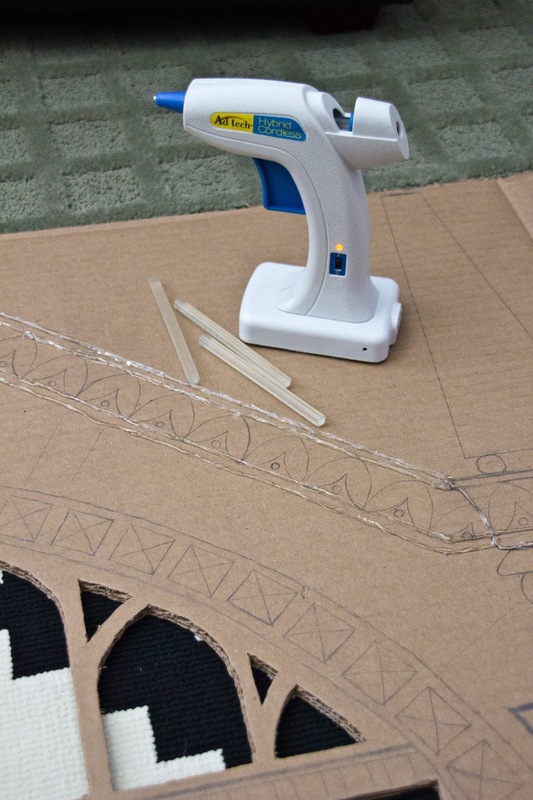 By tracing everything you outlined in hot glue you are helping to define the edges of the design and creating a 3D effect that makes everything really POP! 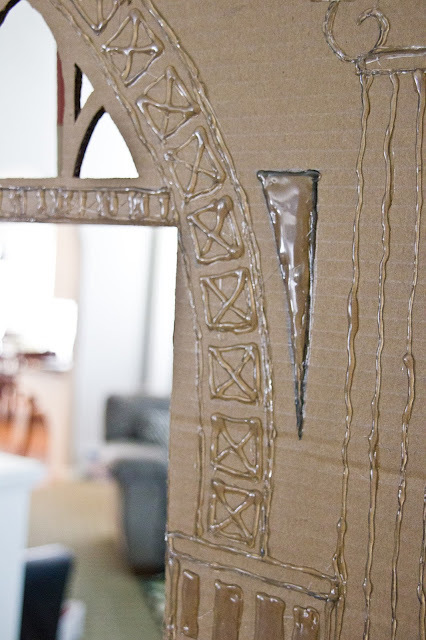 Make sure you get a LOT of glue because there are many lines you need to go over and I probably used 40-50+ mini glue sticks! 2. I think the imperfections add to the aged look were going for. 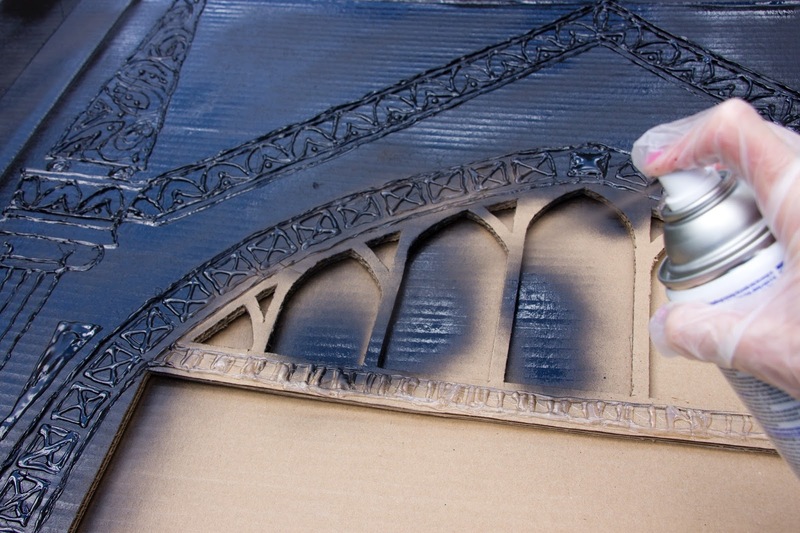 I spray painted the entire frame black, front and back so that the actual frame part would really pop once painted. Having the base color be black helped create a primer for the gold paint and was helpful to allow some of the gold shows through later it will look aged. After it aired out I brought it into my kitchen and laid it on a $1 throw away table cover to get ready to paint. 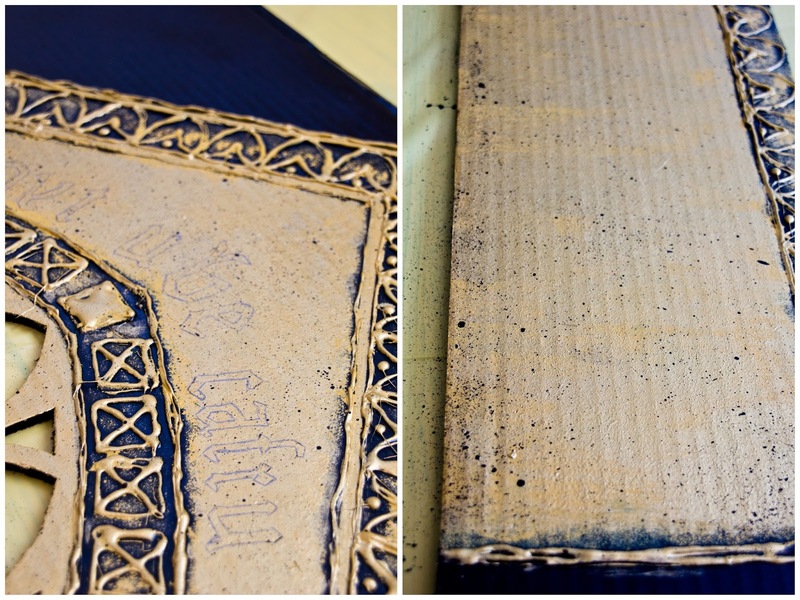 I didn't want the frame to be a solid gold color because I wanted it to look used, worn and aged. So I used this matte gold paint with a sponge top applicator I put on in place of the paint cap. Then I lightly patted the color onto the cardboard. 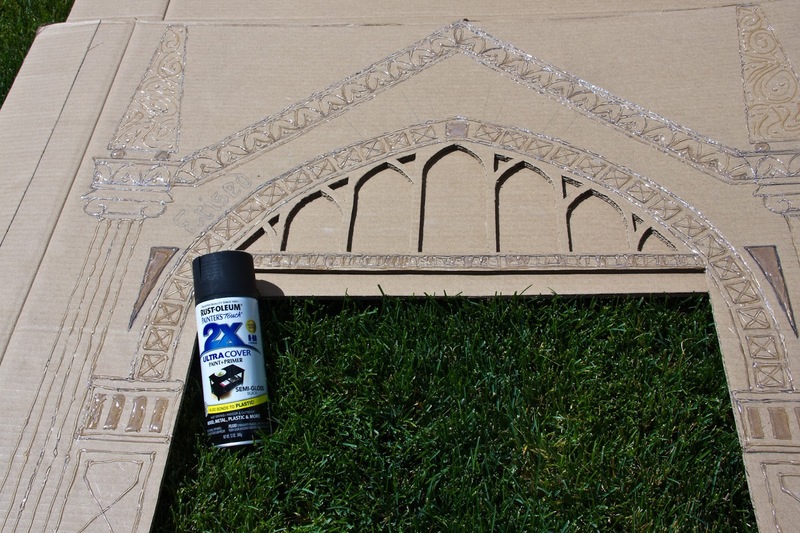 TIP: Where there is a space with the glue design I made sure to leave some black showing to show the depth and make it really pop. 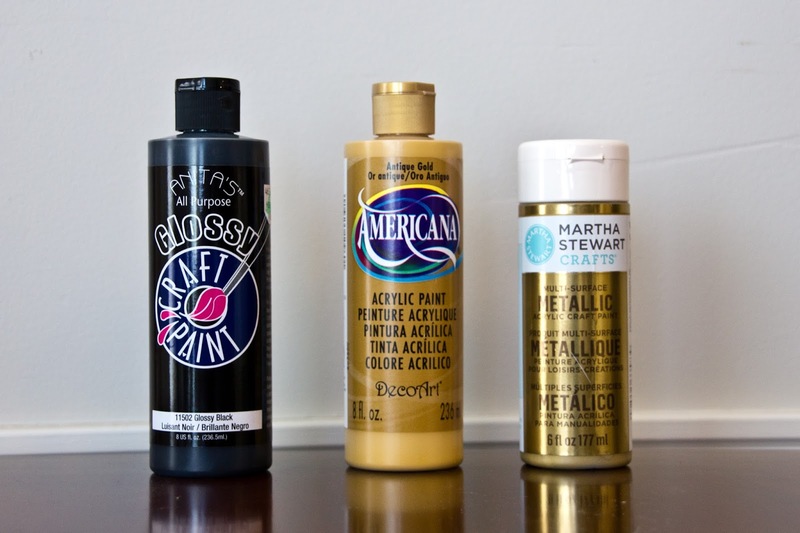 Next I went in with this smaller foam brush to lightly brush on a layer of the Martha Stewart Metallic Gold Paint. 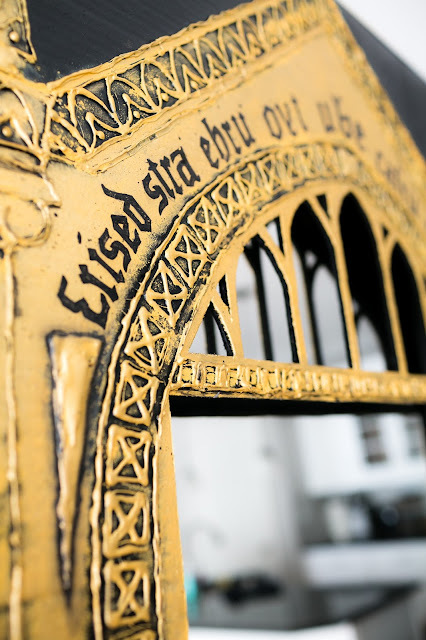 This really made the mirror shine and I liked it a lot more than just the matte gold. I still made sure that some of the matte gold peeked through to add that worn look. You can see the difference that metallic paint makes here. I wanted it to look even more ancient so I decided to take some black paint in a small cup and water it down a little. Next I took an old toothbrush and carefully began using my thumb to spray little specks all over the gold part of the frame. 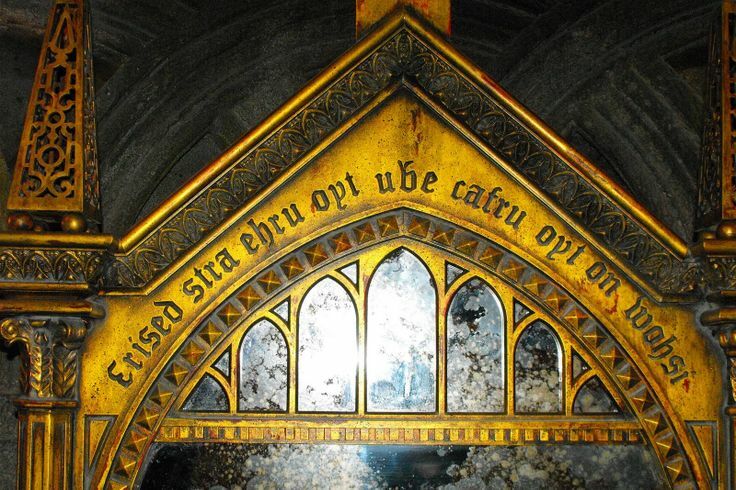 Lastly, I hand drew the words at the top of the mirror. 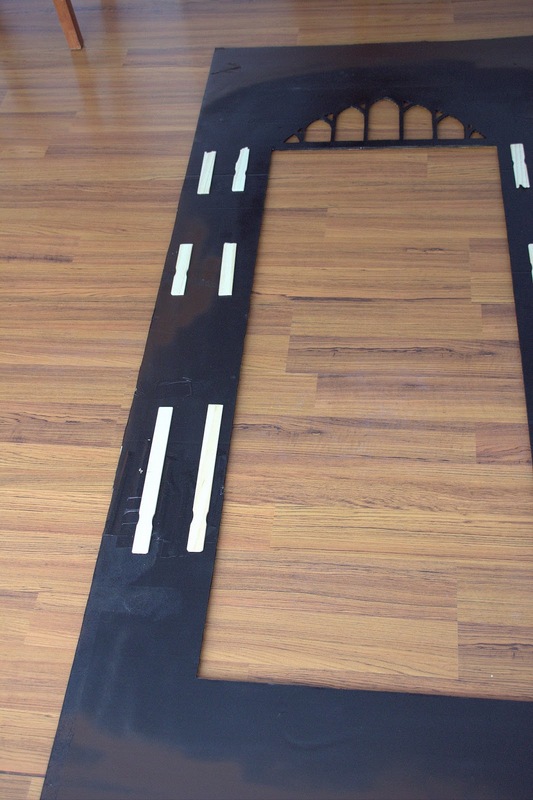 Since our mirrors might not match the mirror we used, we decided to not do a template. Print out close up copy of the top of mirror like we did and just do your best to mimic the lettering. It's best to start with the middle "ube" word then work outward. 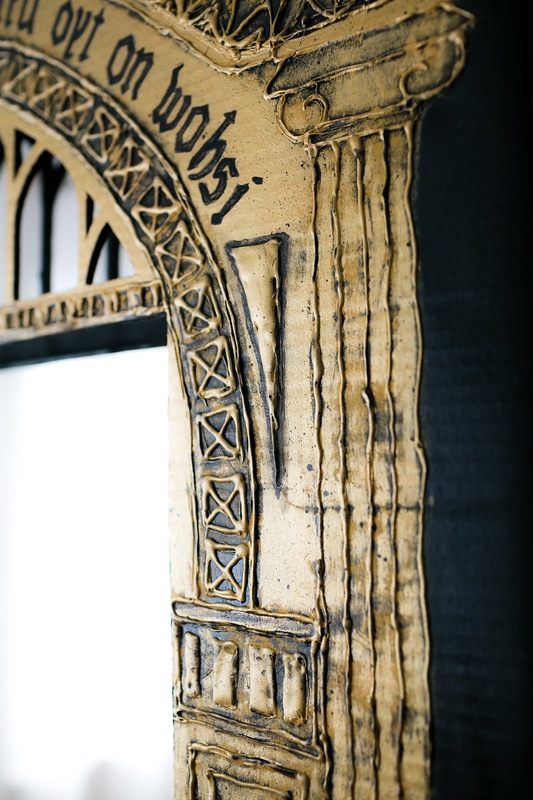 Again, it doesn't need to be perfect, imperfections add to the look of the mirror and from a distance it will look good! "I show not your face but your heart's desire"
backwards, with the spaces rearranged. "Erised stra ehru oyt ube cafru oyt on wohsi." 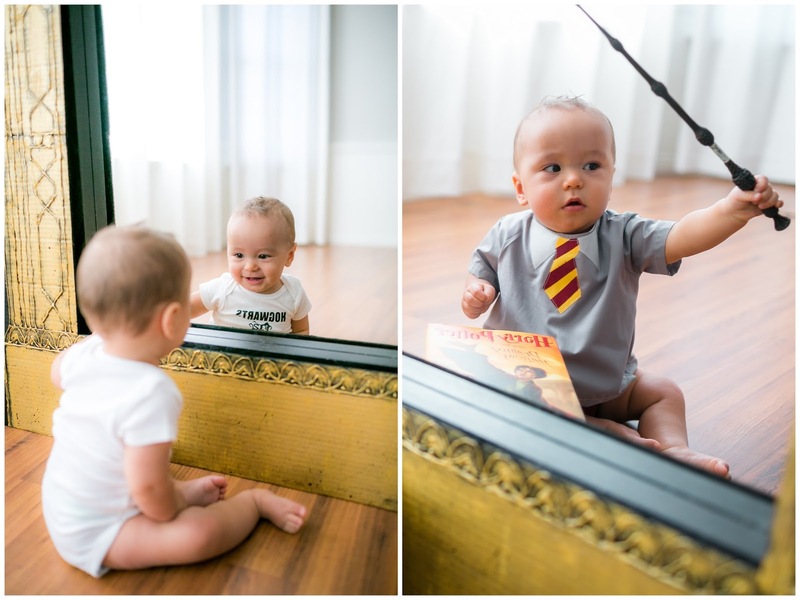 *All these photos were taken by the talented Summer Nicole Photography along with the use of her adorable baby boy. Thank you Summer for being brave enough to herd three babies for this shoot! 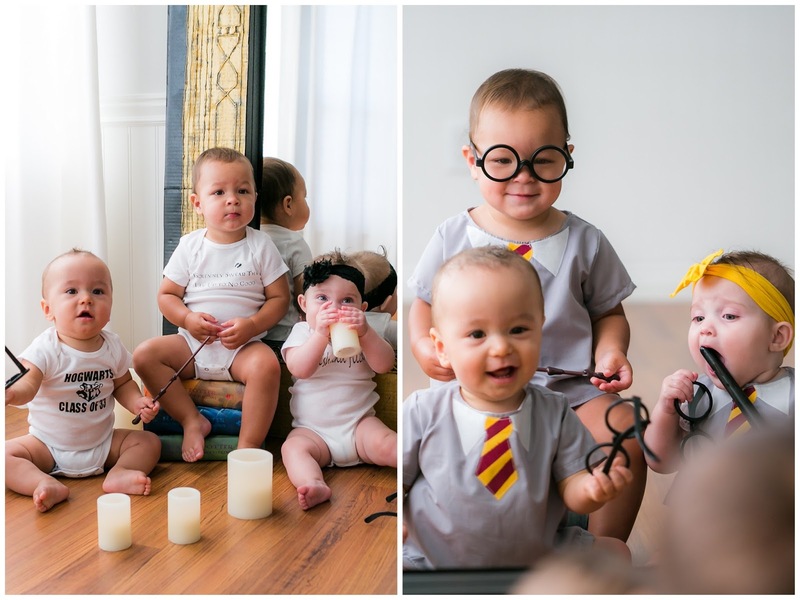 I also need to give a BIG thank you to Marissa for not only letting me borrow her sweet son as well but for also providing these muggle babies with their custom made Harry Potter themed onesies! 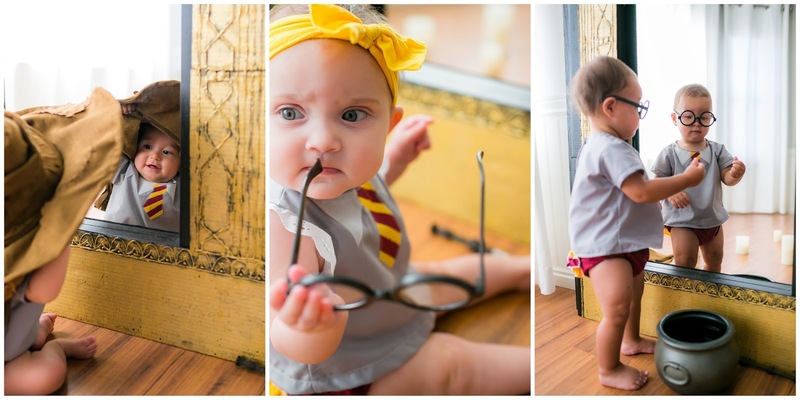 Marissa also made the most DARLING Harry Potter OUTFITS in these photos that you can find in her shop. 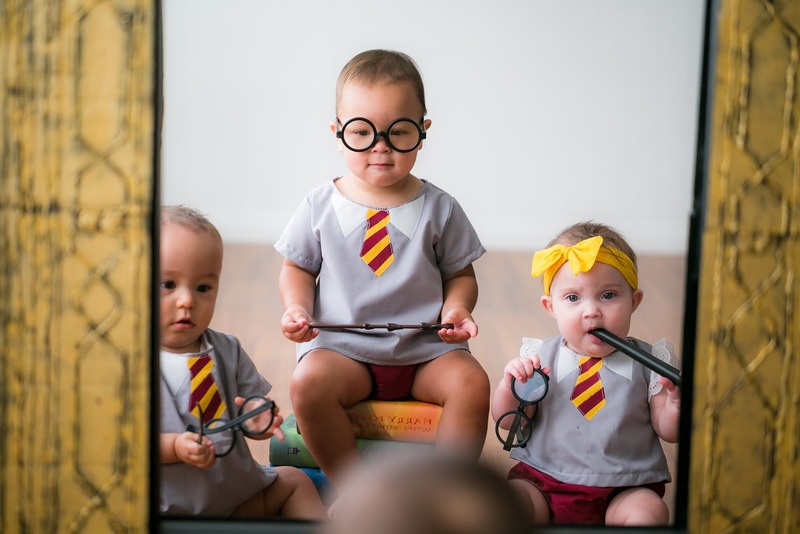 These three sweet babes WISH with all their hearts that they could attend Hogwarts, School of Witchcraft and Wizardry, but alas, they are only mere Muggles and cannot attend. 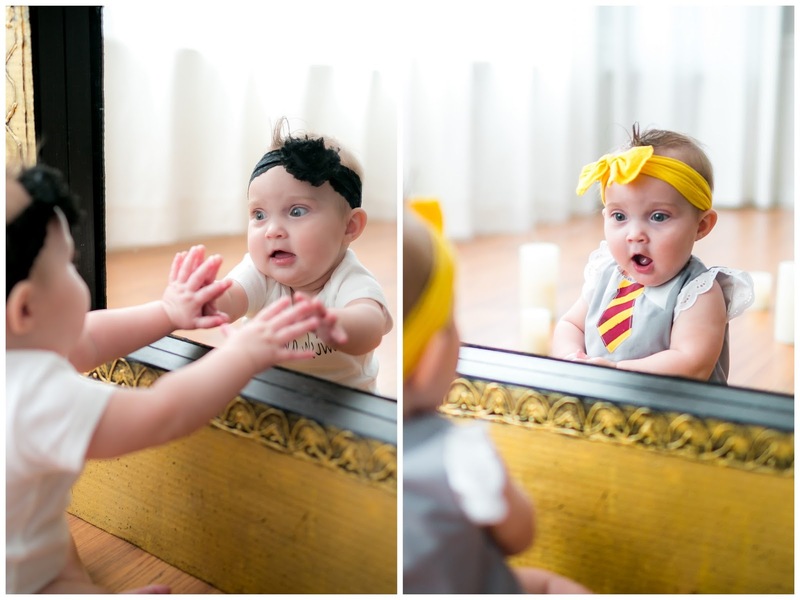 So, when they longingly gazed into the magical Mirror of Erised they each suddenly saw themselves not as they were, but as official Hogwarts students! 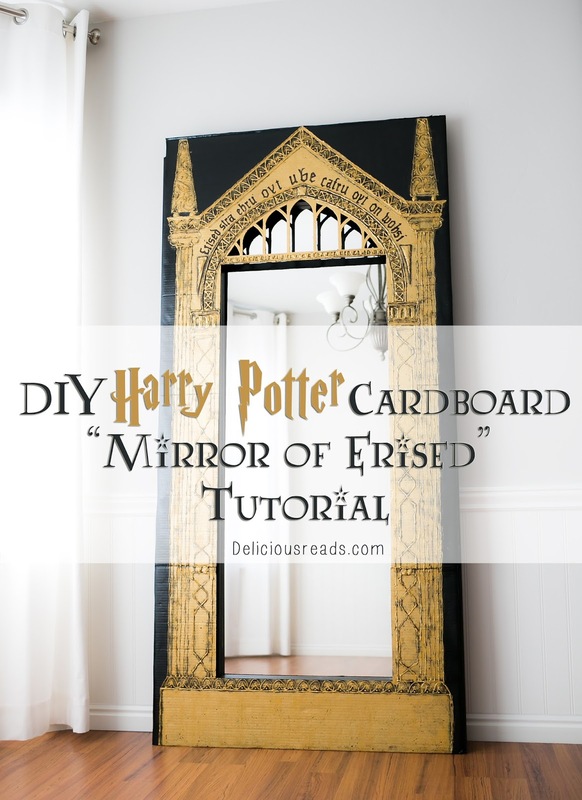 Here's how I envisioned using this mirror as a unique photo prop for your next Harry Potter event. 2. THEN have that person either change into a different outfit (a superhero, someone they admire, different era etc.) or have them use props provided and take another photo . That second photo will show the rest of us what they're heart really desires! 3. Collage the two photos side-by-side like I have done here to show the before and after of each person looking into the MAGICAL Mirror of Erised! 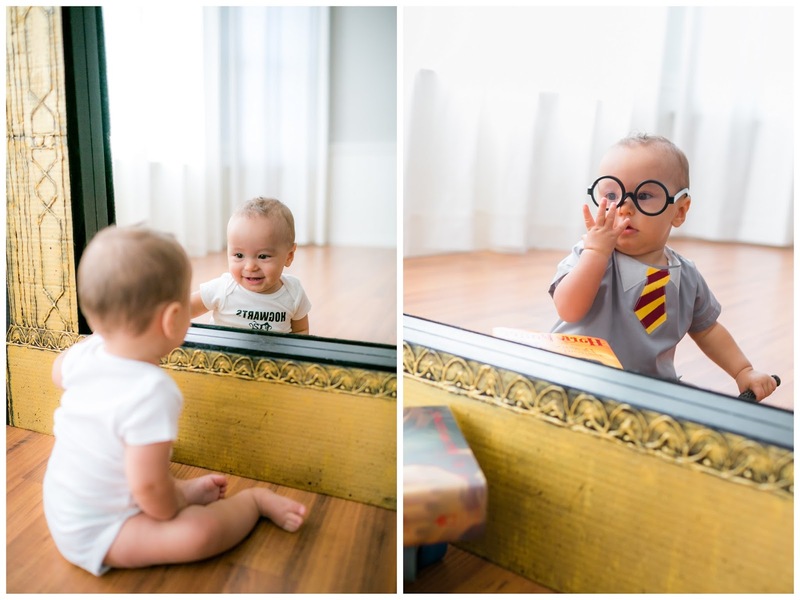 I hope you are inspired to create a little magic of your own and read a little Harry Potter to your littles in the process. 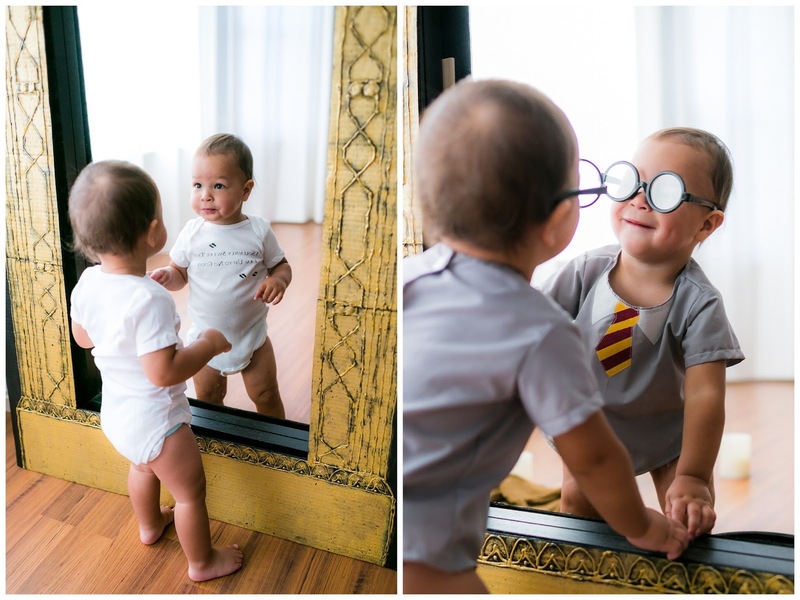 We should share our love of imagination and fantasy with our children as much as we can in this tech era, and I know reading Harry Potter to our babies will only help that wish to come true. 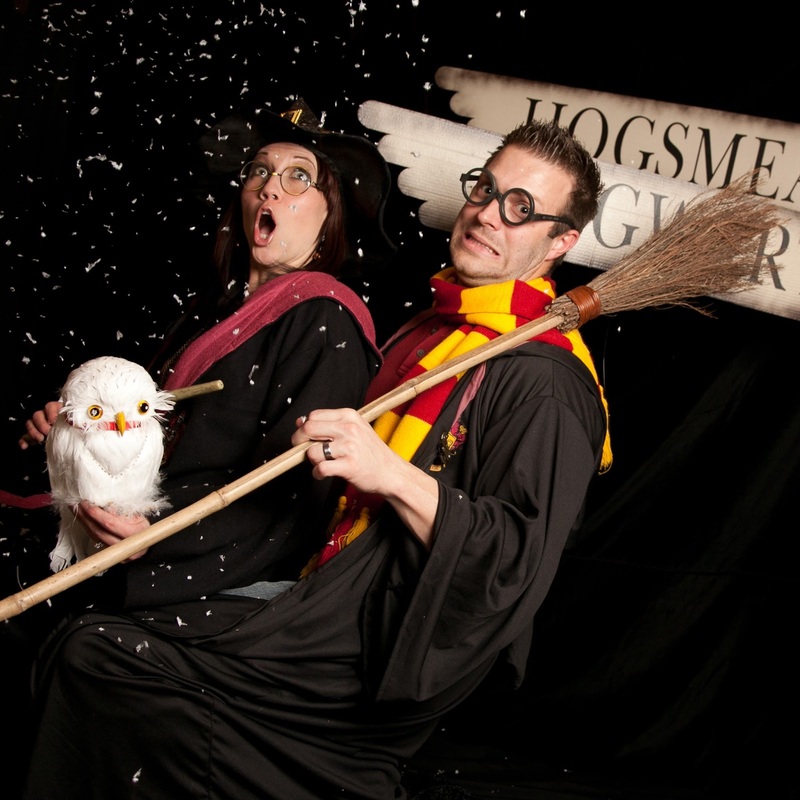 Be sure to head over to Rae Gun Ramblings to check out all of the other Harry Potter ideas. And make sure you remember SUMMER for all our photography needs because her work is beautiful!!! 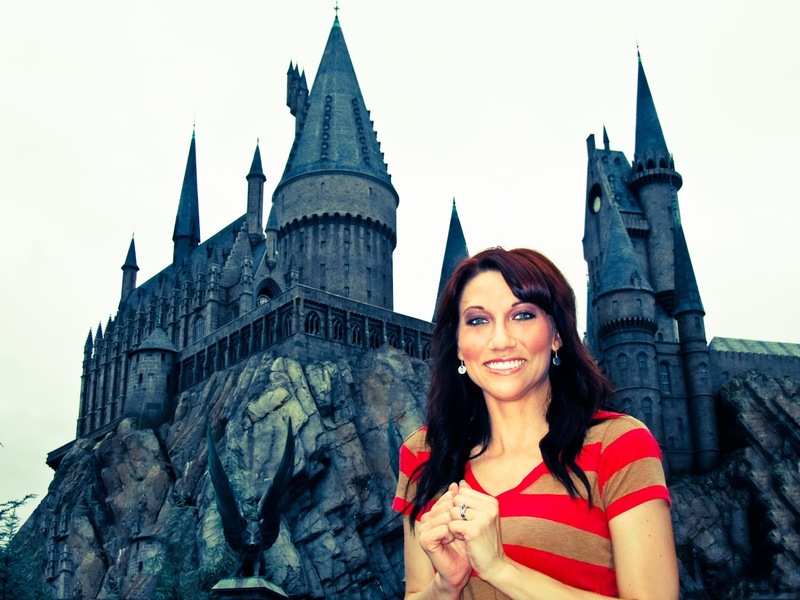 I love how alive and real the Wizardin world is. 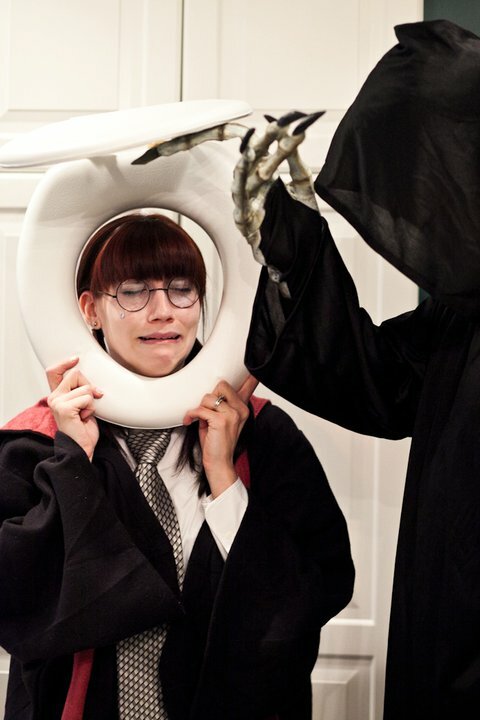 Rowlings does this so well. Love all things Harry Potter!! This is incredible. What a great idea. 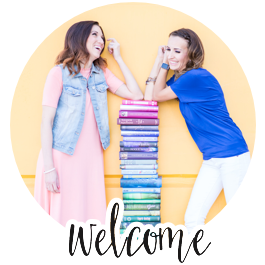 My half-sister and I just started a blog called "the Half Blood Sisters" and we posted a tutorial on how to make a robe. Of course, that's been done before, but this I have not seen. 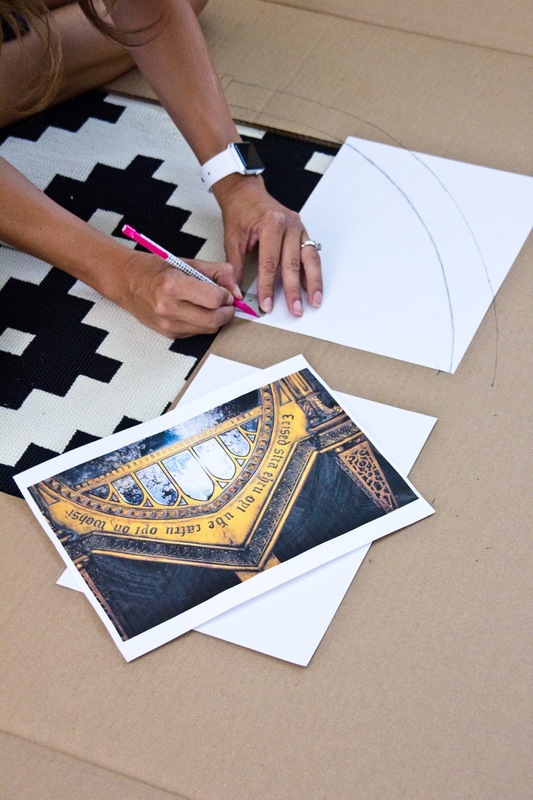 I think I'll have to scour the HP films to see what other tutorials we could to too! 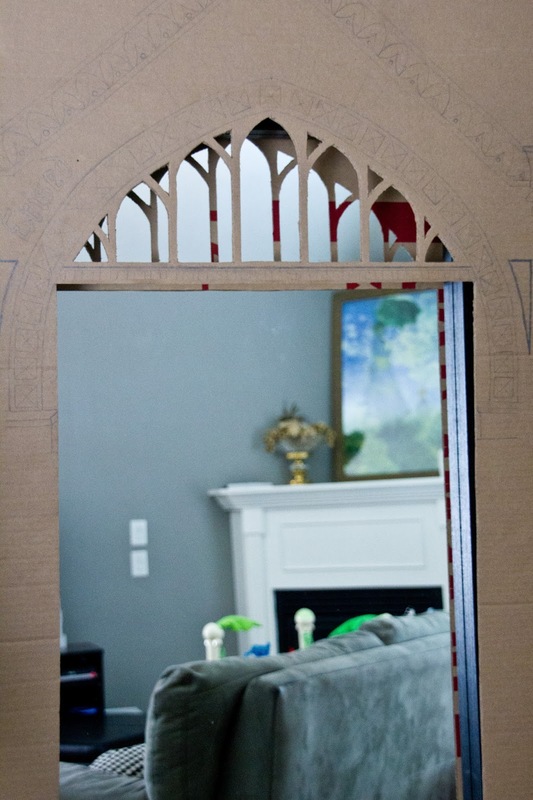 My half-sister and I are making this mirror this weekend, thanks for doing all the hard work--I never would have thought of using hot glue to add dimension!! This is awesome! I found an amazing mirror just about the same size as yours at JoAnn Fabrics and got super cheap with a coupon! 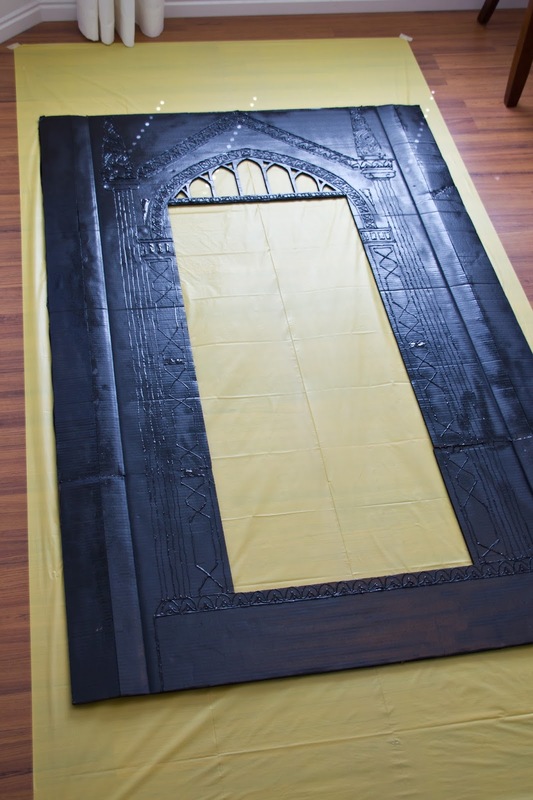 We're finalizing all the other materials and attempt to make it this weekend for our Harry Potter themed bathroom! So excited! Love this so much! 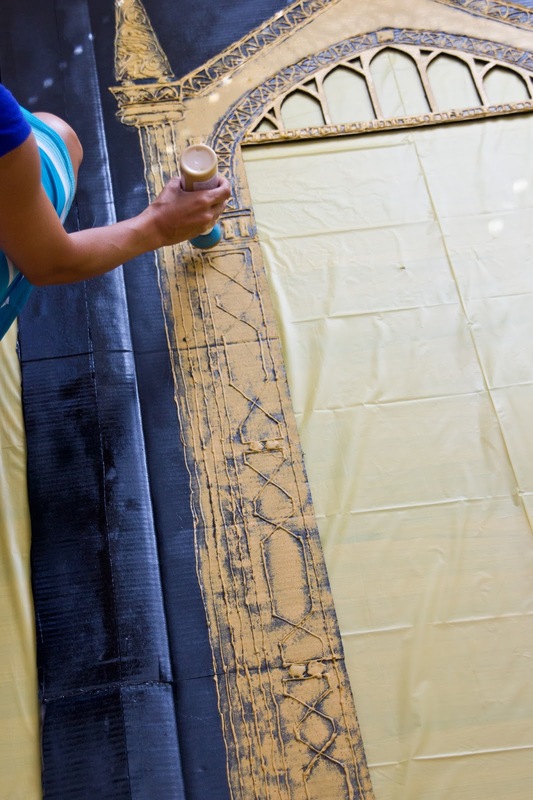 Going to make it for my wedding photo booth, :) Can you tell me where you bought the sponge top applicator for the paint? I tried to google but nothing close comes up. Thanks for sharing! I just finished making this and it turned out amazing!!! thank you so much for posting a tutorial and sharing your ideas! 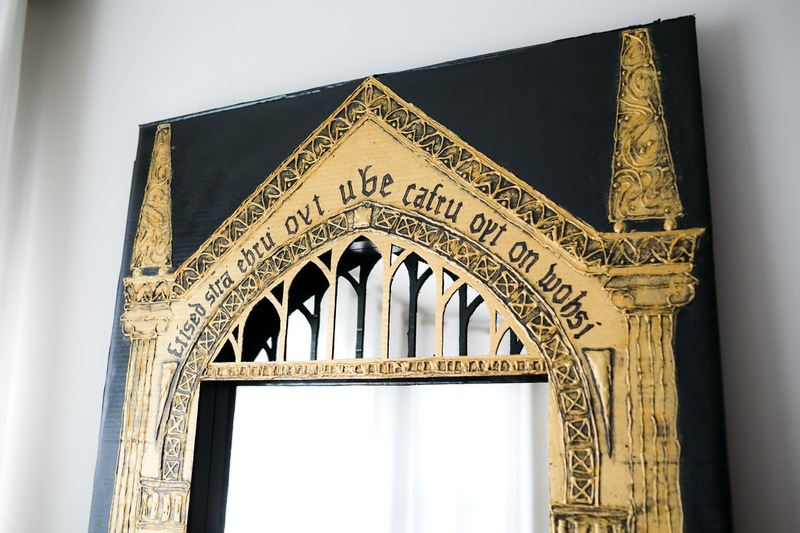 My brother is going to love having this in his Harry Potter themed Room! I love this tutorial! Thank you so much for all of your hard work, and for sharing it with the rest of us in easy steps we can follow! I hope mine turns out as well! After going so far as to pricing prop replicas of this & seeing how outrageously expensive they are at only a fraction of the scaled size, I thought I was going to lose my mind. Stumbled across this on Pinterest & wanted to say you did an absolutely incredible job. I can't wait to get everything together to give it a shot. 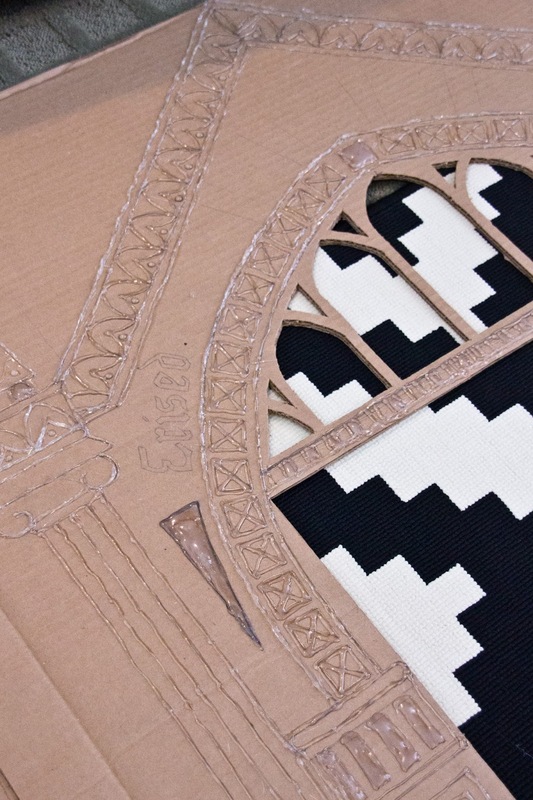 Thank you so much for sharing this awesome project! 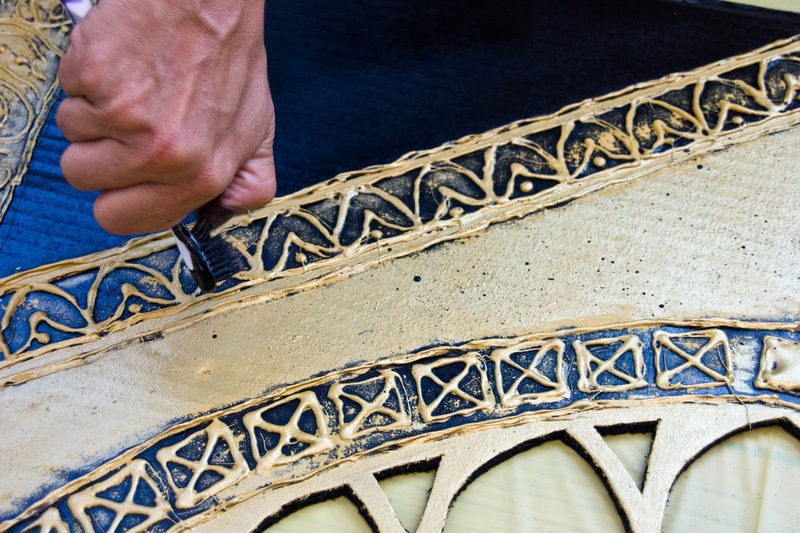 Hi there, we are currently making this mirror and are doing the antique gold layer. Did yours turn out kinda looking green? Is it just that I need to do another layer of gold? This looks awesome! I really want to try it for my son's birthday but you have definitely set the bar high!! Any possible way to commission you to make this for me?